Anytime I see these little suckers on a restaurant menu, I am almost always certain to order them. 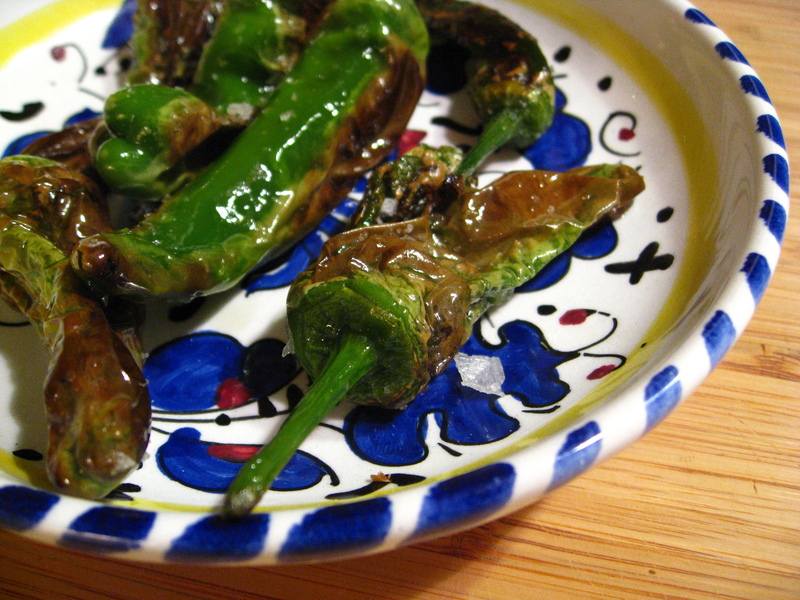 They are simple, salty little snacks that are most often found in Spanish tapas bars. They are mostly very mild, but every now and then you get a surprise spicy one which is part of the fun. After a recent trip to Barcelona I brought back a packet of seeds to see if I could grow and replicate this plate at home. The result: success. If you can’t find your own seeds or seedlings to grow in your garden, these peppers are growing in popularity and can often be found in grocery stores or local farmers’ markets. Add olive oil to a hot pan, when the oil is hot and shimmering add the peppers. Cook and stir the peppers until the skin is brown and blistered about 2-3 minutes. Remove the peppers from the pan, place on a plate and sprinkle with Maldon salt to taste.